Each month Vee hosts a Note Card Party - she asks us to choose four images previously posted on our blog that we think might be suitable for printing as note cards. This month, I am longing for spring, hoping for colour in my garden where there is little, and so I went back to find images of spring past. Are these flowers not glorious examples of springtime abundance? I can hardly wait to see them in real life again. We are redoing our garden beds this year and I didn't plant bulbs last fall. I'm really regretting that now. I have a few in pots that will have to do. Do you have a favourite spring flower? Mine changes with what's in season. To me, each blossom is full of the very best kind of magic - life after winter. Today's sunny skies have me thinking that a walk after lunch would be the very best thing I could do. Tell me, what are the signs of spring around your place? Linking with Vee's Note Card Party. Oh I do love the borders you've chosen to complement the note cards. They really look elegant. This would make one heavenly set of cards. I really don't have spring flowers...a couple of daffodils and a few hyacinths. I've never replanted tulips since the skunks had a hey day with them one year. Guess that I look forward to the forsythia and the azalea bushes blooming for spring color and my neighbors' tulips. These are so beautiful. I love all the color in the midst of winter. I got your card today! Thank you so much. These are gorgeous! Such colors. I can't decide on a favorite... I DO love spring flowers, and can't wait until the weather breaks, so I can go out & investigate what's going on in our flower beds. Spring cannot come soon enough for me. These are all so pretty! I wish I could remember to put mine into a mosaic at the end! I love seeing them altogether! Sweet hugs! All lovely choices . . . I think the grape hyacinth is my favourite. Lovely flower note cards. I am longing for spring and chose flowers for my cards this month too. Simply lovely. I think my favorite flower is the one I am looking at, at any time. Stunning photos...glorious color! Thank you for this peep at spring, Lorrie! Beautiful note cards! I can't wait for the lilacs to bloom in my yard, I love the scent! We are very, very close to seeing the first colors of 'spring' here...tete a tete daffodils and our daphne. I, of course, can hardly wait! OMG - your photos are absolutely breathtaking! Lorrie your note cards are wonderful you have framed them all so beautifully, I would buy the lot! Daffodils, has to be daffodils for me. OOO, you win the prize.!! These are just beautiful and would make wonderful note cards. Just the beauty I needed this morning! It is snowing here and I am longing for Spring! Beautiful notecards! I'd pick them up in a flash. So what program are you using to frame your photos? That's just the right touch. Hi Judy. I use Picasa (downloaded to my computer, not the online version) to edit my photos. One of the image processing options is a museum matte. I used that. It's possible to choose the frame colour and to adjust the width of it all, too. Anyone would be pleased to receive on a card as pretty as each of these. I like the polka dots on the snowdrops. Well Done! 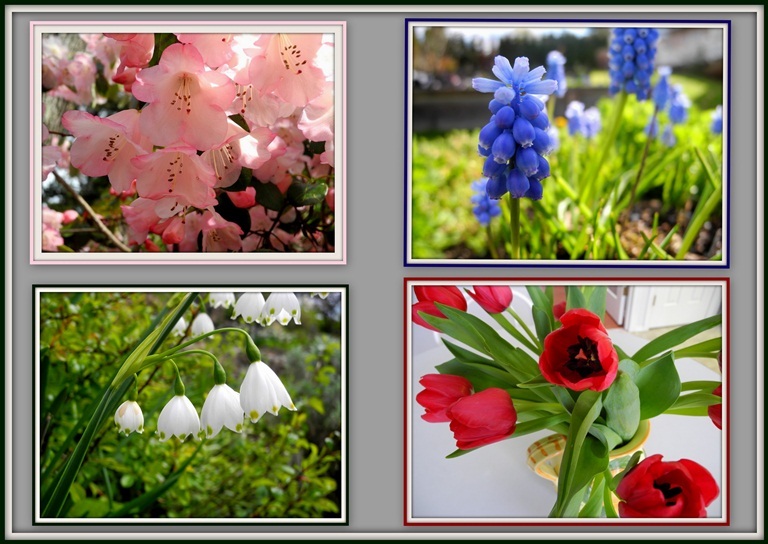 The spring flowers make beautiful note cards. Glad you're feeling well enough for a walk. Enjoy. Love your posy pics! Isn't it amazing to think those flowers are now molecular level outside but pixel viewable inside? Beautiful! I love signs of spring! I love the first bright greens and I think the lavender lilac tree is one of my favorite! These are are quite lovely! Ah, your photos are giving me spring fever! We have two daffodils that are blooming right now in our flowerbeds, and many more to come. Daffies are my favorite in the spring. I also adore our daylilies! I am longing for spring, too. I am ready for the bright and cheerful colors are back and the flowers are blooming again. Such pretty pictures! I love the second picture the best. Oh and I love header! I love buttons and stamps. Thank you for visiting my blog and I hope you have a great day!